New Holland Publishers Pty Ltd.
5/39 Woodside Ave, Northcote, Auckland 0627, New Zealand. I am very grateful to Lucia Donnelly and Christine King in the respective New Holland Publishers’ offices either side of the world in Australia and England for sending me this excellent book recently. The book was published last year so, whilst this review can only be written a while after its publication, I quickly discovered what a fine book it is. Mark Browning’s name has been synonymous with World Cup cricket and it is excellent to have a report on each and every World Cup match up to the start of this year’s tournament. Brought out in time for the 2015 tournament, this fine book may, one hopes, be updated by Mark and James Grapsas with similar reports from all the matches from the 2015 tournament. 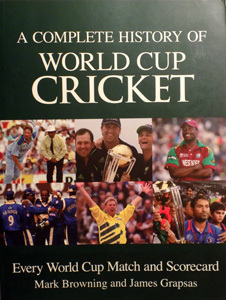 What is so helpful about A Complete History of World Cup Cricket is, whilst reports of previous tournaments can be found in the relevant Wisden, to have a full history within one book is indeed highly useful. Other than on the front and back covers, there are no photographs but the match reports are most detailed with a full scorecard which is naturally the most necessary prerequisite. At the end of the book, each tournament has some statistics. Without going into too much detail, the nitty-gritty is here as is a final resume of all tournaments between 1975 and 2011 inclusive. This is a terrific book for anyone wanting to easily find details of any World Cup match and Mark Browning and James Grapsas are to be congratulated on this tome.